Inner hair cell afferent synapses can be damaged by temporary noise exposures without loss of hair cells. 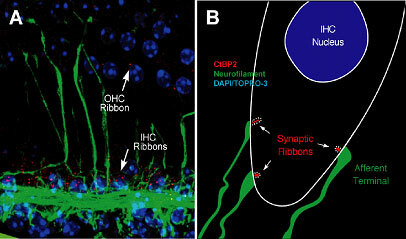 Each type-1 afferent contacts an inner hair cell (IHC) via a terminal apposed to a synaptic ribbon (schmatic shown in B). Terminals can be stained with anti-neurofilament (green) and ribbons with anti-CtBP2 (red) thus allowing counts of afferent synapses. In control ears, there are ˜17.5 ribbons per inner hair cell (IHC), however, after a noise damage resulting in temporary loss of auditory thresholds (TTS), there is dramatic loss of ribbons and terminals by 3 days post-exposure. There is no loss of IHCs or OHCs (as nuclei are stained with a chromatin dye, DAPI). Inner hair cell afferent synapses. Researcher: Anne E. Luebke, Ph.D.